Well, it is now Plebe Parents Weekend here in Annapolis, Maryland and I’m still alive. There’s still a week left of Plebe Summer (training) and the AC year, pronounced ACK (see what I did there) for academic year, starts right afterwards. As of now, there appears to be no problem with me developing and being employed by the military. I’ll try to keep developing and posting to the blog throughout the year. 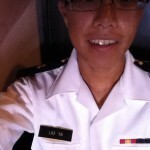 Update 1 (8/21/12) - Plebe Summer has ended and I’ve begun my studies at the academy. My schedule is pretty packed and I’m not allowed to keep a mac at the academy. Not much time or opportunity to develop during the week. I’ll be able to access a mac off the campus periodically during the weekends so most support and coding work will take place then.